I was ready to trash Firefox after the last upgrade. Tabs kept turning into new windows in response to trivial mouse movements. It’s a bug — an extremely annoying one — clicking a tab once and then moving your mouse down causes a new window to open. Click tools >> Add-ons (or type Alt-T, Alt-A). On the bug489729, click “Options”. 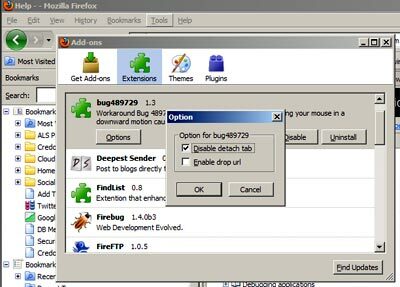 Enabling “Drop URL” will restore an older Firefox feature that lets you drag a Tab to a folder to create a link.